The modern landscape is full of boundaries. Individual parcels of land are defined by ownership, signified by lines on maps and physically built up by walls, fences, and signage on the ground. Archaeological sites have inherited this boundary system in recent centuries, with borders inevitably drawn around or through important places of the past, effectively declaring where they begin and where they end. A cultural landscape, however, rarely begins and ends so abruptly. Instead, it flows outward from centers of knowledge and practice across the land, affecting individuals and communities almost as invisibly (yet persistently) as the wind. The body of photographic work exhibited here has been shaped by these ideas of land, culture and boundaries. 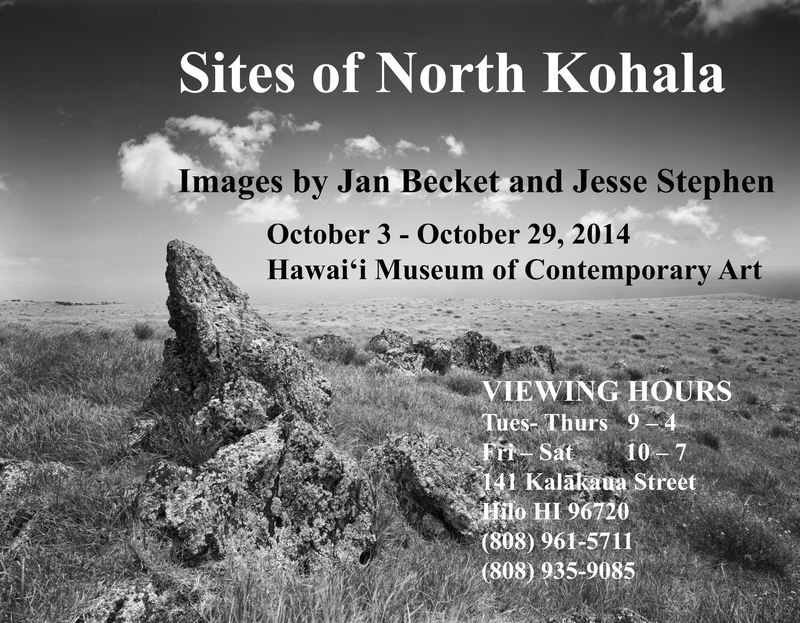 Sparked by archaeological fieldwork that has identified, documented and studied earthen and stone features related to ancient agricultural production, these photographic recordings of structures across North Kohala have inevitably led to the exhibition of something more ephemeral – and ultimately perhaps less knowable – than straightforward identification and documentation. 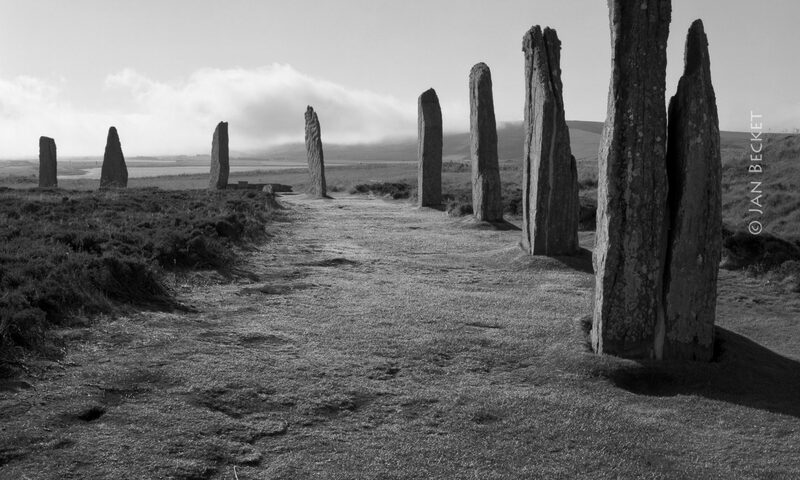 With both archaeological research and photography encompassing sites built for agricultural, habitation and ceremonial purposes (as well those with mixed and changing functions), these photographs collectively present an invitation not only to view individual architectural features but also glimpse the cumulative cultural significance of their presence on the landscape, even centuries after their initial construction and use. These images suggest the subtle, complex interaction between culture and land. However, a cultural landscape is made up of far more than carefully placed stone structures. Moʻolelo (stories, histories), language, place names, cultural practices, indigenous plants — all define a cultural landscape. This deeper layer of significance should be for residents of Kohala to communicate. The land under these structures has shifted in ways both subtle and dramatic, as has the culture that gave rise to them. The archaeological sites of North Kohala, nonetheless, endure to remind us of what yet stands upon and colors the region. Of course, such remnants persist not simply as reminders of the past but also as foundations for contemporary culture. While a continuing cultural presence varies across the places pictured in this work, from the extensive rites of Hoʻokuʻikahi held at Puʻukoholā heiau each year to the lonely presence of a simple mauka shelter, they all hold a cumulative power both now and for the future. They carry cultural significance for Hawaiians, and also possess an aesthetic beauty that is capable of transcending cultural boundaries. The greatest challenge facing Kohala’s remarkable landscape may be the inherent nature of modern boundaries to divide places, often along lines unknown in the past. While the land development that already encroaches upon many of these sites is near certain to continue, not only the individual structures are at risk. There are more than stones to be protected. The integrity of each place is in constant flux and thus depends nearly as heavily on what happens nearby as on the material preservation of the structure itself. Long known for the sheer variety and uniqueness of its winds, North Kohala and its deep history is a cultural treasure to all residents of Hawaiʻi, Hawaiians and non-Hawaiians alike. In light of this broader perspective we hope that the numerous cultural landscapes of North Kohala – indivisible from the archaeological sites presented here – can endure. Ultimately all of us who call Hawaiʻi home are obligated to ensure that they do. If ritual sites are relatively well preserved in the mauka areas of Kohala and relatively well known from the leeward coasts, the windward sites are neither well known or preserved. Yet, when surveyed in the early 20th century, there were 9 named named heiau along the windward coast, although even then several had been apparently destroyed, usually by road building or sugar cane cultivation. When surveyed in the early 20th century, all of the named heiau in windward Kohala were located along or relatively close to the coast, generally on cliff lines or edges, but often along side or at the coastal front of streams. Based on earlier accounts coastal heiau were regularly spaced, often located at or near community boundaries, with view planes of the coastline and ocean, or of surrounding agricultural areas. Among the best and still preserved heiau are three found on cliff lines between Hālawa and Niuli‘i Gulches. Just east of Hālawa, on the cliff overlooking the ocean and gulch is the site known as Hale o Kā‘ili, associated with Kamehameha I and said to have been where he kept the image of Kūkailimoku, the war god with which he had been entrusted upon the death of his uncle. Kapālama near Kapania Bay is one of the largest heiau, based on area, nearly 110,000 square feet although over much of its area it consists of a paving of water worn rock on the surface. Finally, Kupalaha‘a heiau is located on the cliff above Kēōkea Bay near the boundary of Makapala and Niulii. This site sits on the cliff edge and now has a large opening to the ocean below in its center courtyard. It was built of multiple terraces, with walls around the perimeters and considerable paving with water worn cobbles. It has walls and alignments that extend down slope to a large lo‘i complex that fronts Kēōkea Bay. Windward Kohala heiau are noted for the great variety of forms they encompass, including walled enclosures, forms with multiple, steep retaining walls, platforms or rock pavings on surfaces, and at least two that were excavated below grade or out of surrounding basalt bedrock. Many of these heiau, like Kupalaha‘a, were associated with l‘oi complexes or streams highlighting again the close relationship between farming, in this of the irrigated variety, and ritual in Kohala. The leeward makai sites extend from the southwestern corner of North Kohala up to the tip of the peninsula, encompassing the northernmost extent of Hawai‘i Island. Many of these sites look across the Alenuihaha Channel to the shoreline of Maui beyond. This passageway has long been a crossroads connecting the Big Island to the rest of the archipelago and the broader region of Oceania. Although these photographs principally juxtapose architectural remnants with species of trees and grasses that have been recently introduced, the sheltered bays and rocky shores upon which they lie nevertheless retain a timeless quality. Two important places bookend this particular stretch of coastline. Known to be luakini heiau, Pu‘ukoholā and Mo‘okini are each examples of a class of ceremonial structure that were built by Hawaiians from the 14th century until the end of the 18th century. Pu‘ukoholā was completed in 1791 by Kamehameha I after the arrival of the first Europeans but before the abolishment of the kapu system in 1819. Ethnohistoric sources recount its construction as part of Kamehameha’s quest to subjugate his rivals. Capping the top of a small hill (as referenced by its name, which translates literally as “hill of the whale”), its high backing wall and elevated terrace dominate the bay of Kawaihae. Less is known about Mo‘okini, which may have been built many centuries before Pu‘ukoholā. Like Pu‘ukoholā, this heiau would have been central to the ruling powers of Kohala of its time. Constructed on relatively level ground, Mo‘okini features high walls around its perimeter, with limited access into its interior space. 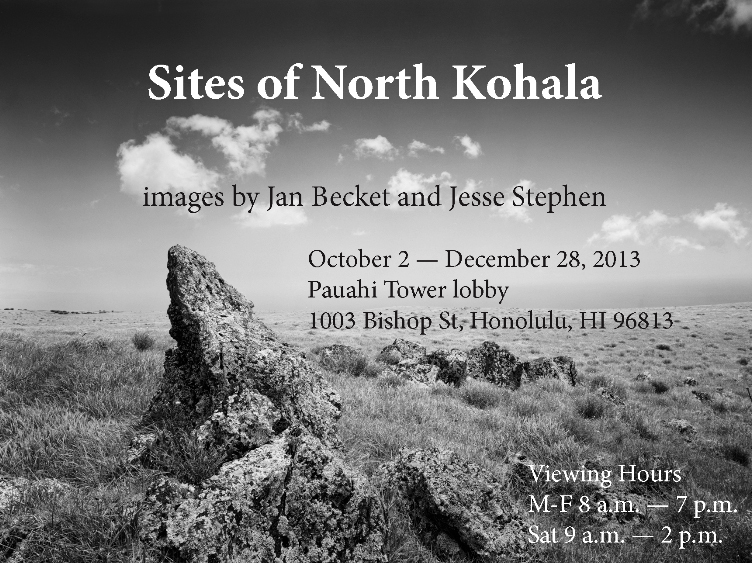 Alongside oral and written histories as well as contemporary practices of Hawaiian culture relating these sites to the ancient high chiefs, the large format prints of this exhibition study how architecture and landscape can be combined to form a powerful presence. While certain sites are highly visible today due to their size, location, or known historical significance, the leeward coastline is populated by an abundance of less obvious archaeological ruins. It was in this area that a focus on settlement patterns was pioneered in Hawai‘i as an archaeological approach. Archaeologists realized that examining entire regions, rather than individual sites, can be more effective for addressing certain types of questions. This strategy was successful at better understanding the distribution and development of the archaeological record within the ancient Hawaiian territorial divisions that partition the coast. The structures featured in this portion of the exhibition are thus often components within architectural complexes. They are frequently situated near a variety of other buildings that each served a distinct purpose and were firmly set within an ahupua‘a. Although architecture linked to ceremonial activities is the primary subject pictured here, each site invariably manifests unique aspects that do not necessarily fit with the entire group. For example, unlike every other structure featured, the site of Kukuipahu contains a great number of hewn (quarried and dressed) basalt slabs which are thoroughly incorporated into its foundation and walls. Perhaps what we are seeing is a preference for something particular, perhaps not. Regardless, it is the case that for as long as these structures stand along Kohala’s leeward coast – as many of them have for centuries – the opportunity for learning and living with them remains. The sites pictured here vary in many respects but they share a common theme: the ancient organization of dry land farming in Kohala. From broad views over a long abandoned agricultural field system to renderings of modest small stone structures, these images offer a sense of what can still be seen of a long and productive past in the upper reaches of leeward Kohala. .As a peninsula with a number of bays and relatively undeveloped coastline, it is possible to overlook the lands that comprise the district’s interior. Indeed, an early 20th century account of ancient Hawaiian ritual sites (or heiau) describes only those on or near both the windward and leeward coasts. It mentions nothing of the uplands. However, the upper slopes of Kohala were developed over several centuries on this, the Big Island’s oldest mountain, to become finest example of an integral component of ancient Hawaiian society: dryland farming. All of the architectural remnants featured in this portion of the exhibition once played a role in dryland farming, or the cultivation of crops in the absence of irrigation. Completely reliant on rainfall, this was nevertheless an intensive form of agriculture, and one that provided Hawaiian chiefdoms with quantities of uʻala (sweet potato; Ipomoea batatas) and dryland kalo (taro; Colocasia esculenta) as well as other cultigens (e.g., sugarcane, ti, gourds, yams). Estimates of the area developed for this purpose exceed twenty-three square miles, or more than 11,000 football fields! Two hallmarks of the Kohala Dryland Field System are linear agricultural alignments (generally appearing as long field borders on the land) oriented perpendicular to the slope and the prevailing trade winds, and a series of trails and alignments that segment the field borders into various sized plots of land. Situated alongside and sometimes integrated into these features, are other types of structures – ranging from simple C-shaped terraces used for housing, drylaid masonry exclosures to keep out livestock, and to monumental platforms, terraces. These myriad features of upland Kohala had many different functional purposes—for farming, for herding, for living and for rituals and ceremonies, and it is not surprising that these stone foundations also take on a wide variety of forms. It is the architectural features consistent with ceremonial or ritual use that are perhaps the most intriguing, and which are primarily pictured here. They are abundant in the area, with more than 30 identified as shrines or heiau. With the celebration of the Makahiki season and the gathering of offerings, including various cultivated foods, on an annual basis, such sites would have been integral parts of the social as well as the physical landscape. In the context of the Kohala Field System, such structures appear to have been built in styles and scales beyond those of other architecture, displaying unique construction attributes such as courtyards, notched (or inverted) corners and the incorporation of upright stones into walls. They were often placed in prominent places on or near community boundaries with vistas that included cinder cones (pu’u), the ocean (kai), land and seascapes, fields as well as other ritual sites Many of these characteristics may be observed in these photographs, as if to remind us that what may appear today as quiet and solitary places have not necessarily always have been so in the past. 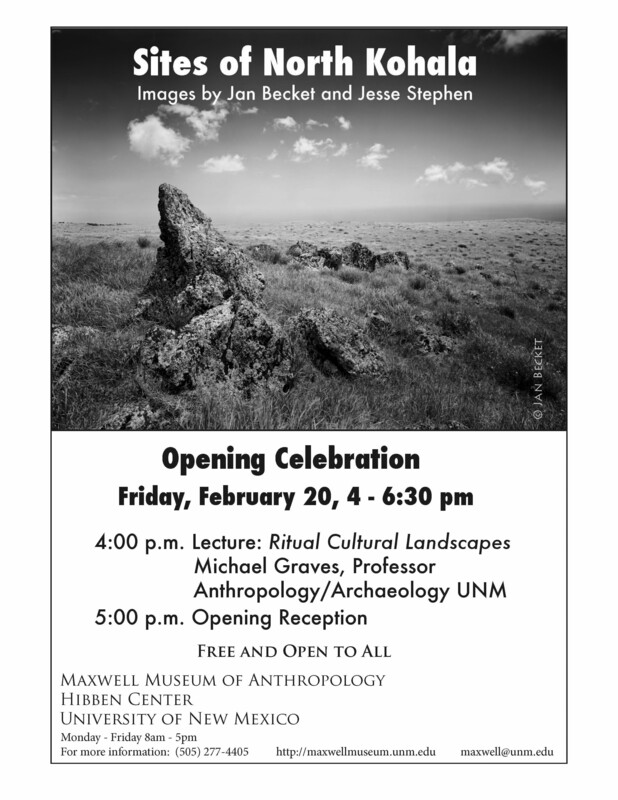 The exhibit consists of 50 black-and-white images by Jan Becket and 11 color images by Jesse Stephen. Most images are 16X20, but several are diptych 32X40 inches, and several others are linear panoramas. The exhibit includes eight maps of individual sites. The black-and-white images are printed with Eboni 6 carbon pigment ink on Epson Cold Press Natural paper with profiles made by Jan Becket.